The Griz now set their sights on Homecoming weekend at the University of Montana, and the team’s fourth home game of the season when the Portland State Vikings come to Missoula on Saturday, Oct. 6. With a team that features 16 freshmen compared to just nine seniors listed on this week’s two-deep, these young Grizzlies are growing up fast, and as the business end of the season approaches, head coach Bobby Hauck likes the progress his cubs have made. “We’re off to a decent start. We’ve improved through the first five games,” said Hauck. THE GAME: The Griz will get the chance to make more progress on toward their return to the FCS playoffs against Portland State this weekend, a team that enters the contest having lost 17 of its last 18 games, but presents a bigger challenge than the record may indicate. “With (head coach) Bruce (Barnum) being there, they’re always going to find a way to run it. They’re going to try to control the game with their rush offense,” said Hauck. Offensively, the Vikings and Grizzlies put up similar numbers on the ground, grinding out 854 yards of rushing offense and 1,057 yards in the air, thanks to Jalani Eason, the QB with the most efficient passing numbers in the league. Defensively, PSU held Idaho to under 300 yards of total offense in Moscow last week and allowed 166 yards in the air and just one offensive touchdown in a 7-20 loss to the Vandals. Kickoff for the Montana/Portland State game is set for 2:07 at Washington-Grizzly Stadium. HOMECOMING HAPPENINGS: The Grizzlies return to the annual Yell Night Homecoming Pep Rally on Friday, Oct. 5 at 8 p.m. on the Oval in the heart of the UM campus. Hear from Griz players, Coach Hauck, and the Grizzly Marching Band, be on hand for the ceremonial “Lighting of the M” a rendition of “Old College Chums” sung by the Campus Chorus on the steps of Main Hall, and enjoy fireworks too. PARADE: On Saturday morning, join other Montana alumni and the Missoula community for the annual Homecoming Parade, starting at 10 a.m. on North Higgins Ave. APPROACHING HISTORY: Despite being just halfway through his first season back at Montana, Hauck is nearing some historic milestones as a head coach. With a win over Portland State, Hauck will hit 100 career wins and will reach 50 career wins in the Big Sky Conference. But here’s the big one: As the head coach of the Grizzlies, he will also hit 85 career wins, tying him with the great Don Read for the most wins in Montana history. A sixth win this season would make Hauck the winningest Grizzly coach of all time. SERIES HISTORY: The Griz and Vikings have been squaring off since 1965, and since 1996 as mutual members of the Big Sky Conference. In that time UM has built a 30-12 record and a 17-3 record in Missoula. Most of Montana’s 12 losses against PSU (9) came before they joined the Big Sky in 1996, with UM holding a 16-3 advantage since then. LAST MEETING: Justin Strong intercepted three PSU passes, returning the third one for a touchdown as Montana led from bell to bell in a 45-33 win in Portland in 2017. Strong actually had a fourth interception on a two-point conversion attempt, but PAT statistics don’t count toward the players’ overall statistics. Linebacker Connor Strahm also foiled a PSU two-point conversion, intercepting a PAT pass attempt and taking it 100 yards for a two-point score for the Griz. WATCH: The Montana/Portland State Homecoming game will be broadcast over the air and on cable systems statewide on your local FOX Montana station (except in Billings where the game will be seen on SWX, channel 8.2 and Spectrum channel 503). Fans worldwide able to tune in for FREE via WatchBigSky.com and the PlutoTV app (channel 237) on their smartphone, tablet, smart TV or over-the-top device (Apple TV, Roku, Google Chromecast, etc.). Ron Davis will provide the play-by-play, alongside former Grizzly head coach Mick Delaney on color commentary and former Grizzly QB Grady Bennett serving as analyst. Shaun Rainey will report from the sideline. Looking ahead, the game at North Dakota will be produced by Midco sports (UND’s broadcast partner) and will be simulcast on FOX Montana stations statewide, as well as available to stream on WatchBigSky.com and the PlutoTV app, channel 240. UC Davis at Montana will be the final game of the year on Cowles Montana Media stations and will be broadcast statewide on ABC Montana while streaming on WatchBigSky.com and PlutoTV channel 237. LISTEN: “Voice of the Griz” Riley Corcoran and Greg Sundberg will bring you the action live from Washington-Grizzly Stadium on the Grizzly Sports Radio Network. DANTE’S INFERNO / TOP TACKLERS: Dante Olson became the first defensive player since 2010 (EWU linebacker & Buchanan Award winner J.C. Sherritt) to win three ROOT Sports Big Sky Defensive Player of the Week awards in a season this week… and it only took him one month of football to do so. Olson posted the second-most tackles in Montana history last week with 24 against Cal Poly’s triple-option attack. Tim Hauck is the school record holder (since 1973) in single-game tackles with 25 against Fresno State in 1989. Olson’s 24 tackles are the most in FCS football, his season total of 79 tackles is the best in the Big Sky Conference and the entire nation as well. In 2018, only one other player in all of college football – at any level – has had more total tackles in a game, with Oklahoma linebacker Kenneth Murray picking up 28 against Army, which also runs the triple-option offense. Olson now has more tackles this season than his previous two seasons combined with 146 career takedowns. He needs 55 more tackles in his career to become one of the top-40 tacklers of all-time at UM. KEEPING IT CLEAN: For the second-straight game, Montana held the penalties in check, only giving up three against both Sac State and Cal Poly. That six is way down compared to the first three games of the season where the Griz suffered a total of 26 combined penalties. Not only are the Griz keeping their noses clean on penalties, but they are also taking care of the football, giving up just one turnover in the past two games, a single interception against Cal Poly after the game was already in hand. RECORDS WATCH: First, the obvious. Dante Olson. See above. Second most tackles in a game in UM history. Not a bad day at the office. Jerry Louie-McGee moved into a tie for 9th place on UM’s all-time pass receptions list with 161 following the Cal Poly game. He’s tied with Etu Molden (1999-01) at No. 9 and is just four catches shy of passing Marc Mariani’s career total of 164 catches. Senior Keenan Curran moved into a tie with Jefferson Heidelberger (2001-04) on the all-time receiving yards list at No. 21 with 1,733 after the Cal Poly game. With eight tackles at Cal Poly, Josh Buss passed Erik Stoll (2008-10) on the all-time tackles list at No. 33 with 230. He needs just four more to pass Alex Shaw (2008-11) and Blaine McElmurry (1993-96) at Nos. 32 and 31, respectively. Junior kicker Tim Semenza remained perfect on the season, going 2/2 on field goal attempts at Cal Poly. With a career completion rate of 85.71 percent, Semenza remains the most precise FG kicker in UM history and is the Big Sky’s leading scorer as the only kicker to be a perfect 10/10 this season. Semenza is one of just 13 kickers in the nation to remain perfect after week 5. TRENDING UP: Ten different Grizzlies set or tied a career high at Cal Poly, and as one would imagine against a triple-option offense, most of them were new career high tackle totals. In addition to Olson’s 24, Robby Hauck (17), Josh Sandry (10), Gavin Robertson (10), Jace Lewis (9) and Justin Calhoun (9 – 8 solo) set a new personal best tackle totals against the Mustangs. Montana’s ground game got kicked into high gear for the second-straight week with the emergence of Adam Eastwood, who broke loose for a career-high 132 yards and a pair of TDs in San Luis Obispo. His career day was highlighted by an untouched 68-yard TD burst up the middle, etching his name in the UM record books with one of the longest scoring runs in program history. Eastwood’s 68-yard run is tied at No. 18 for the longest TD run with Rock Svennungsen, who had a 68-yarder against South Dakota in 1973. Dalton Sneed set a new career high with his feet against Sac State, then set a new personal best with his arm against Cal Poly with 285 yards in the air and three passing touchdowns. On the other side of those passes was sophomore receiver Samuel Akem, who had a personal best 93 yards, setting a new personal long TD reception with a 54-yard score. On Special teams, Malik Flowers continues to impress after running back a kick return for a score at Western Illinois. The freshman totaled 95 yards on four returns at Cal Poly and now ranks No. 16 in the nation, averaging 27.1 yards per return. LAST TIME IT HAPPENED: Other than Sneed’s 206-yard day against Sac State, Eastwood became the first Griz to rush for over 100 yards since Makena Simis did it against NAU in 2017. The last Grizzly to do it before that game? Jeremy Calhoun rushed for 124 yards against these Portland State Vikings in 2017. Josh Buss scored the first touchdown of his career with an 80-yard fumble recovery – ruled as such because it bounced into his hands off a backward pass. The last Grizzly to score on a fumble recovery? Donald Bedell jumped on a loose ball in the end zone for a 0-yard return for a score against Mississippi Valley State in 2016. SCOUTING THE VIKINGS: PSU will be looking to put an end to a pair of losing streaks in Missoula this week – 10-straight road game losses and 12-straight Big Sky Conference games. 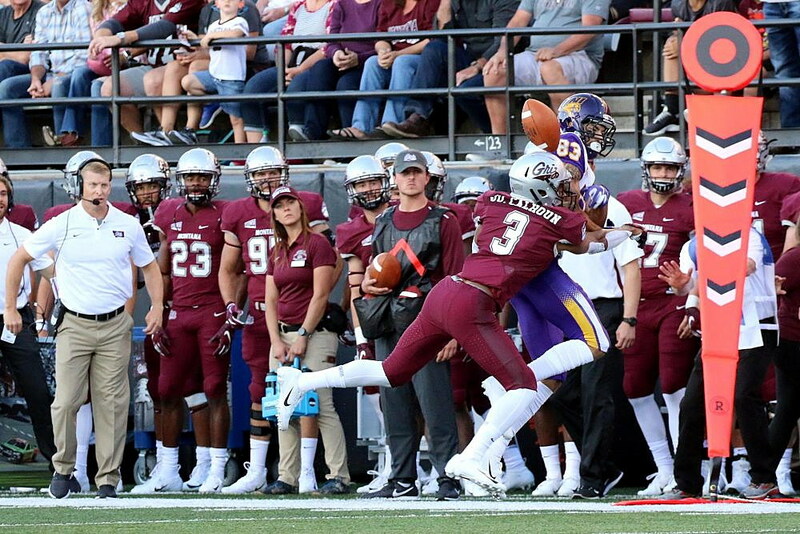 The Griz defense will be focused up on stopping preseason All-America and All-Big Sky tight end Charlie Taumoepeau, who leads the Vikings in receiving with five scores, the seventh-most in the nation. So far this season he’s posted a pair of 100-yard games, coming against FBS programs Oregon and Nevada, scoring four touchdowns, two of which were 70+ yards in each. With an average of 28 yards, Taumoepeau has the most yards per catch in the nation. (fewer than 100 after halftime) and 13 points on defense (the other seven came on a blocked punt return). The Vikings had eight tackles for loss, three sacks and had an interception. ON THE ROAD AGAIN: Viking head coach Bruce Barnum plans on bussing his team to Montana for this weekend’s matchup, something which his players have become accustomed to. Barnum’s “Americana Tour” has logged as many as 4,906 miles by bus in years past, and by the end of 2018, PSU will have logged 4,348 miles, including the 1,098 miles from Portland to Missoula and back. UP NEXT: The Griz return to the road to face North Dakota for a Big Sky Conference matchup, even though UND is no longer in the Big Sky. The Fighting Hawks are now affiliate members of the Big Sky as they transition over to the Missouri Valley Football Conference during the 2018-19 seasons. During that time, UND is ineligible for a Big Sky championship, and they do not maintain a conference record. However, games UND plays against Big Sky teams in that time frame count toward their league win/loss count. What does all this mean? It means the Griz will have their hands full in Grand Forks on Oct. 13 with an upstart Fighting Hawks squad that has picked up momentum with wins over Sam Houston State and Northern Colorado… and the outcome could hold playoff implications for the Griz.